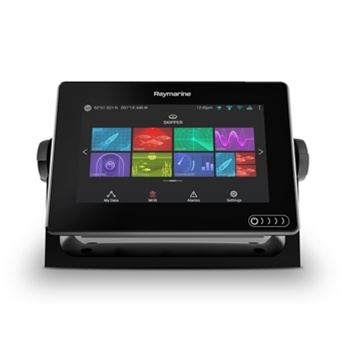 The Raymarine Axiom 7 is a top choice Chartplotter that can be fully networked. Offering a 7” Glass, TouchScreen Display with a 10HZ Internal GPS Antenna, the Axiom 7 will quickly and accurately show your vessels position while moving fluidly across the included Lighthouse Navigation Charting. Raymarine’s Axiom 7LNC with Lighthouse Navigation Charting is a top choice in chartplotters, whether you’re looking for a single display setup or a multi-display set-up the Axiom 7 surely won’t disappoint. The axiom is also fully compatible with C-Map 4D, Navionics Plus and Navionics Platinum Plus. The Axiom 7 can be expanded upon by adding the full range of Raymarine accessories like, radar, CHIRP Sonar, and Flir Cameras just to mention a few. Raymarine has also included their new Lighthouse 3 operating system so your learning curve to use the Axiom 7 is greatly reduced and customizable for your style of navigation. If you are looking to start a Raymarine system on your helm the Axiom 7 should be looked at as your first option, it brings to the table ease of operation and expansion capability at an affordable price point.